Hidden Targets-Casino info about the game-Games2Rule. Targets are hidden all around the place!! 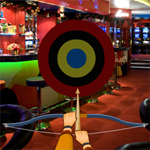 Shoot the target with archer�s bow and arrows. Use mouse to shoot the target. Avoid clicking needlessly, as otherwise your time will get reduced. If finding last three targets is difficult in any level, use the hint option to point out the targets, but using hint option each time will cost you 100 points.